What are SMART delays costing taxpayers? ARRIVAL TIME SMART’s December debut has been pushed to ‘late spring’ due in part to defective crankshafts. Even the most ardent supporter of a commuter train linking Sonoma County to central Marin County has to be feeling a little skeptical these days. The Sonoma Marin Area Rail Transit (SMART) was supposed to be shuttling passengers from Santa Rosa to San Rafael. But a December 2016 promise of service was postponed until "late spring." There was also the promise that a voter-approved quarter-cent sales tax would cover all expenses. That's not happening either. Meanwhile, empty trains roll up and down the North Bay, adding costs to an ambitious, $500 million build-out plan that's growing more expensive by the day. How much is SMART laying out in payroll and other expenses since December? The agency won't say. Public records requests from the Bohemian are pending. The train's social media pages are meanwhile peppered with frustration from citizens weary of the delay: "Trains operating, yet still empty," Jerry Gibson wrote on Facebook. "Our tax dollars hard at work." Missy LePoint wrote: "SMART is dispensing advice on time-management? Hilarious. Just tell us the day that 'late spring' arrives, OK?" And a note from Michael Nelson spoke for long-standing opponents: "Stop, already, enough of this horse crap . . . hope the people that voted for this are happy." The train is still popular among the region's political class, which has proposed it as a traffic-beating alternative along Highway 101. None of the elected officials who championed SMART have publicly wavered, despite delays and budget increases—not even Windsor mayor Deb Fudge. She's been on the SMART district board since 2005, and in January was selected to head the board, notwithstanding the fact that the train is not scheduled to head her way for years—and nobody can say for sure how many. Larkspur vice mayor Daniel Hillmer represents Marin County mayors and councilmembers on the SMART board. He's pleased with the progress. "SMART is performing according to the Measure Q requirements, has balanced budgets and is on schedule," Hillmer says, referring to the Marin measure that partially funded the train in 2008. "SMART continues to make significant progress in preparation for passenger service to begin in the late spring." Hillmer's on-time optimism doesn't jibe with what voters were promised when Measure Q appeared on the ballot nine years ago—a fully operational train ferrying riders from Cloverdale to Larkspur by 2014, paid entirely by a quarter-cent sales tax. SMART spokeswoman Jeanne Mariani-Belding notes that a late-game engine snafu caused the latest delay, as she concedes that "federal and regional grants" had to be called upon to keep the project alive when it became clear that the voter-approved tax was not going to be enough to pay for the train. Expenses keep mounting, a challenging situation which puts more pressure on SMART to deliver a service whose budget is contingent on ridership. Skeptics of SMART's ticket-revenue note that maximum daily round-trip adult fare to ride the train's entire route will be fixed at $23, and SMART is offering a slate of discount rates for regular commuters, seniors, youth and disabled passengers. SMART's funding has long been a challenge. Before Measure Q passed in 2008, Measure R in 2006 failed to earn the two-thirds majority of combined votes between Sonoma and Marin counties. With the most to gain from a train offsetting Highway 101 gridlock, about 70 percent of Sonoma County backed Measure R, but skeptical Marin County voters doomed the proposed quarter-cent tax to pay for SMART. SMART financing returned as Measure Q and incorporated bicycle paths into the mix. That helped nab it the endorsement of the Marin Bicycle Coalition, among the area's more vocal activist groups. Marinites again failed to deliver two-thirds support, but overwhelming support in Sonoma County carried the day (the combined vote eclipsed the two-thirds threshold needed to pass it) and the $500 million SMART commuter train was born—with a then-projected completion date of late 2014 and a promise to link Cloverdale to Larkspur, eventually. But 2008 was more than SMART's birthday—it also marked the onset of the Great Recession. Citing the economy's downturn, the SMART district's revised plan delayed northern Sonoma County SMART service in Healdsburg and Windsor—even as residents there said they needed a commuter train. At the Marin County end of the line, residents sparred with SMART over a proposed two-mile connector line from San Rafael to Larkspur, a key component in getting Bay Area commuters onto cross-bay ferries. That fight was settled recently with the help of North Coast Congressman Jared Huffman and the Larkspur railroad extension was OK-ed with an expected opening in 2018. Down the road, SMART pledges it will stay true to the original plan. "Future expansion plans include Windsor, Healdsburg and Cloverdale, for a total of 70 miles," said Mariani-Belding. SMART critics said the new plan for a "future expansion" belied the original promise made to voters: a complete railway from Cloverdale to Larkspur by 2014. Those opponents complained that the faltering SMART project might have siphoned transportation funds needed for Sonoma and Marin county's decimated rural roads since the agency tapped state and federal transportation grants. A Measure Q repeal push in 2011 failed and now the double-whammy of disappointment: no train, and the roads are still terrible. A faltering late-aughts economy also meant a decrease in tax revenues and pushed SMART's opening to the end of 2016. But a July 2016 engine failure in a Toronto commuter-train system, which uses the same engine-car combination as SMART, pushed the opening into 2017, as all the SMART engines had to be replaced while SMART struggled to sort out problems with its warning systems. "This new engine problem, and the need to complete our system-wide safety testing . . . has led me to the conclusion that beginning of passenger service by the end of 2016 is not advisable," wrote SMART general manager Farhad Mansourian in an October 2016 memo to SMART's board. "We will be working even harder, and target late spring 2017 as our beginning of passenger rail service." 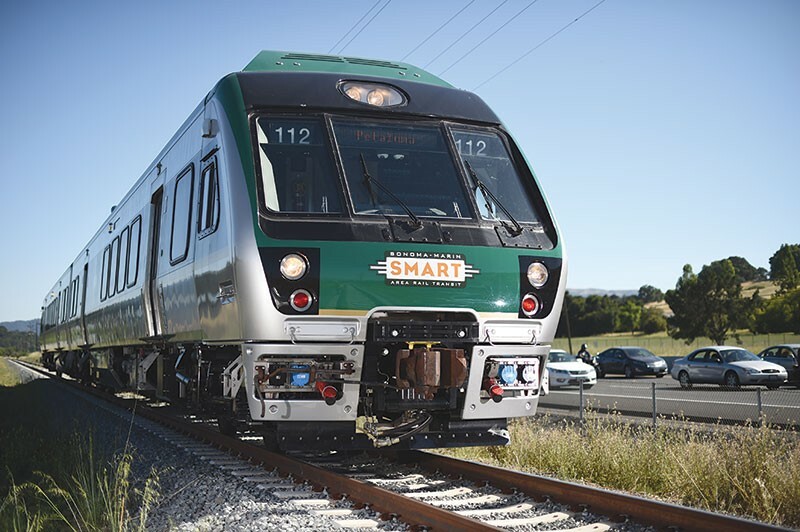 SMART worked with Cummins Inc., which supplied the train's diesel engines, and Nippon Sharyo, which designed the trains, to fix a design flaw in the crankshaft, "and replace all 14 of our engines prior to service," Mariani-Belding explained. The engines are under warranty, and the manufacturer is eating the cost. "Each engine weighs 2.7 tons, so this is no small feat. The good news is that the work is right on schedule, and we now have 13 of the 14 engines replaced." She added that the system as a whole, which has also been beset with road-crossing issues up and down the current 43-mile line, is "in the home stretch of some important system-wide safety testing." Those safety issues have also delayed a final sign-off on the project by the Federal Railroad Administration. The safety tests include the not-infrequent blaring of train horns, which have been met with complaints from residents near the tracks, an audible reminder that SMART is still not up and running.